I've got a bonus #VPJuly post for you all today, to mark the end of our July Extravaganza! 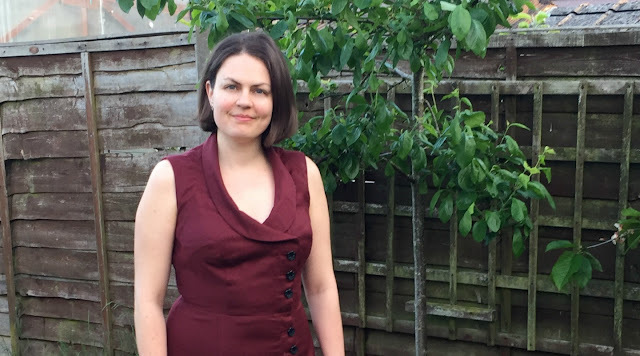 As well as a guest blog over on Kestrel Makes, the inspirational Erin of SeamstressErin Designs is sharing a cool 1970s number with a matching outfit for her beautiful baby girl! 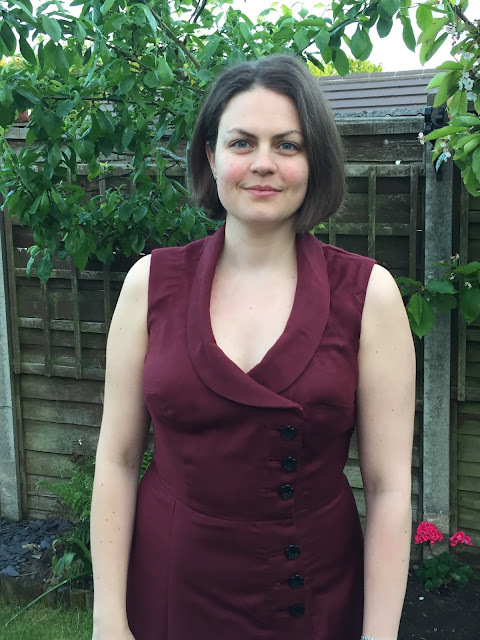 Erin is not only inspiring for taking part despite giving birth very recently, she's also got a Ph.D. in Biochemistry, has a growing range of sewing and knitting patterns and has given us a wonderful insight into the style of some of our favourite bloggers! 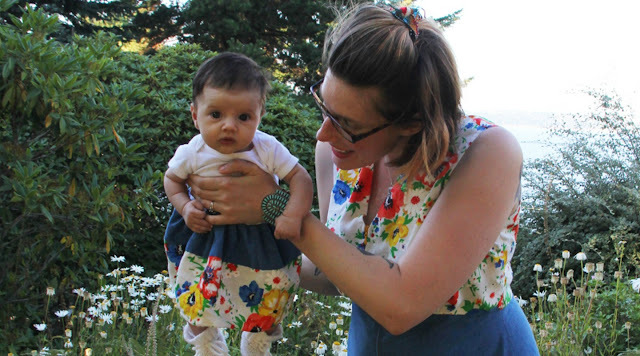 Here I am with my #VPJuly dress (and the little munchkin that has been keeping me from doing much of any sewing). When Marie asked me to take part, she mentioned that she liked that I often sewed vintage patterns but put a modern twist on them. Well, I guess I took that as a challenge to be true to a pattern as this a deviation from my norm since I used a 1970's dress pattern and 1970's fabric with (almost) no modifications! 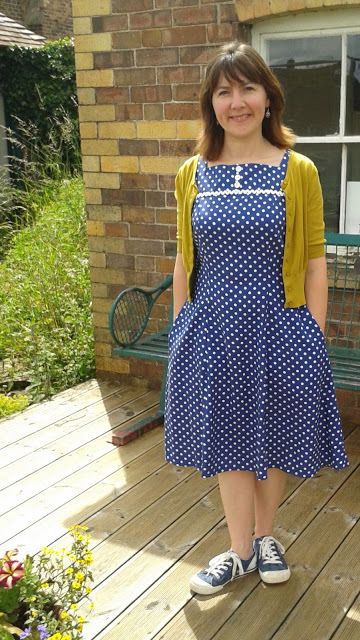 I used Vintage Butterick 3068 that I bought on my honeymoon in New Zealand. I couldn't find a date for the pattern, but it's clearly from the 1970's (those collars are a dead giveaway!). 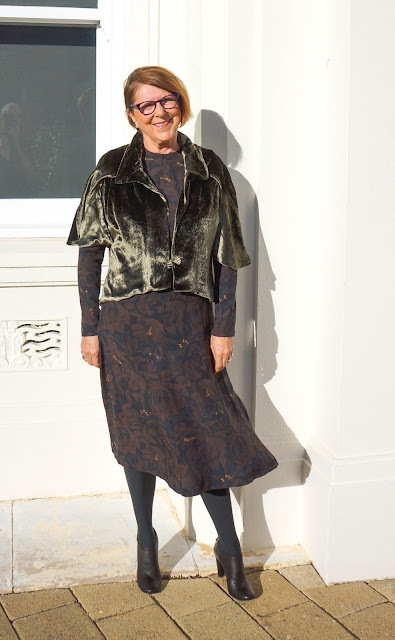 It's described as "semi-fitted, slightly flared dress in mid-knee length has front zipper closing, shaped waistline seam, pointed collar, and sleeve variations." 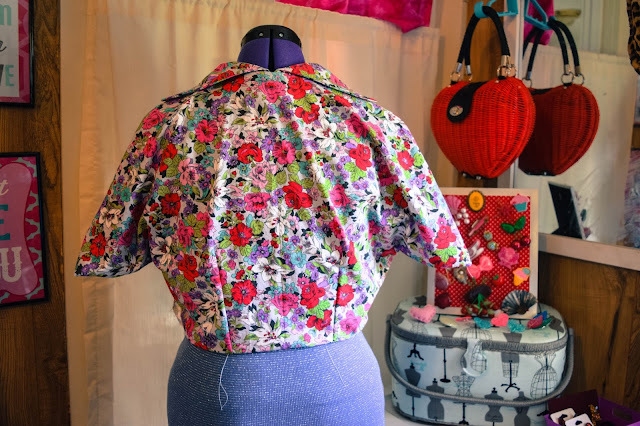 For an explanation of why I agonized over using this fabric and why I picked this pattern, pop on over to the post on my blog. I'm super happy with the finished dress, most especially the bodice as the cheery floral is just so happy-making! 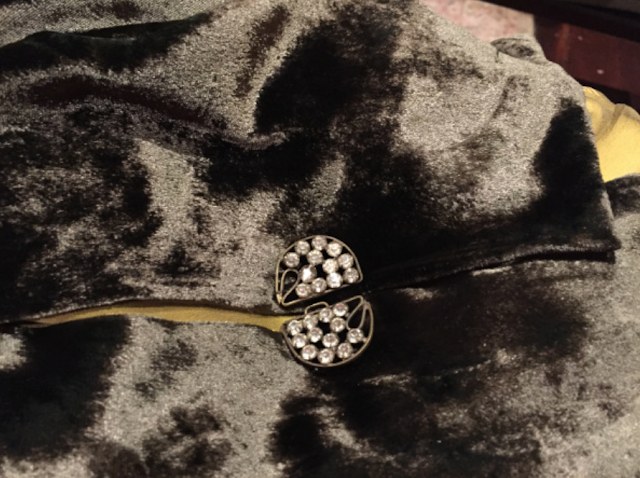 I happened to have a zipper with an interesting pull in my stash in a yellow that coordinated, so I opted to use it, thinking that if I was going to insert a centered zipper, I might as well emphasize it. Normally I would swap centered zippers out for an invisible zipper, but again, I chose to make the dress (almost) as written. I'm kind of obsessed with the pockets on this dress. 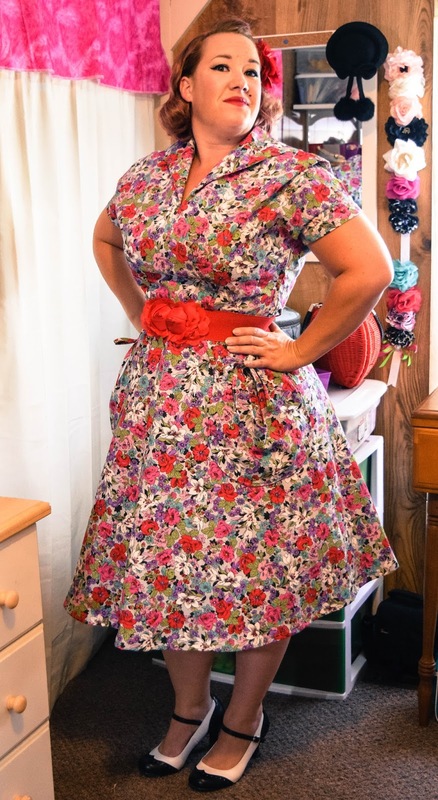 I'd like them a bit more centered (they are set quite wide, but I bet that's how the pattern was graded into this "large" size 16) on future dresses, but it doesn't bug me enough to rip and re-sew the pockets on this dress. 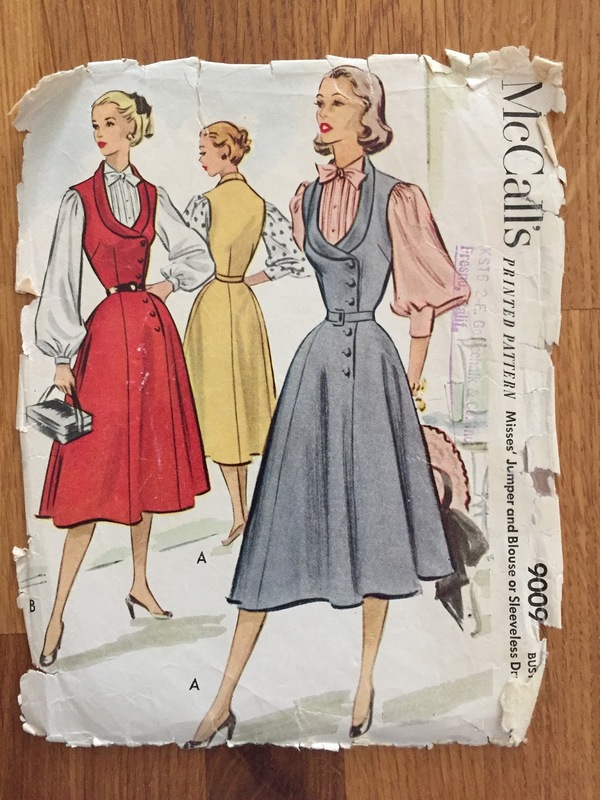 I think one of the most fun things about vintage patterns is the details, and the slanted shape of these pockets that echoes the slanted shape of the waist seam is no exception! Thanks to Marie and Kerry for asking me to take part and for inadvertently encouraging me to sew a vintage dress without adding a modern twist! 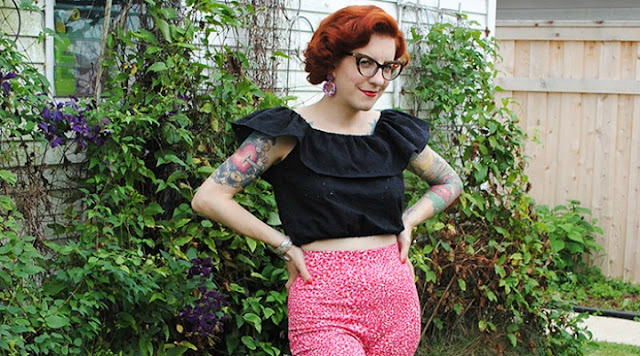 Tasha of By Gum, By Golly may be pint-sized, but she's a vintage sewing and knitting dynamo! Her style is to die for and if you have the pleasure of meeting her, like I have, it'll leave you wishing you were neighbours. 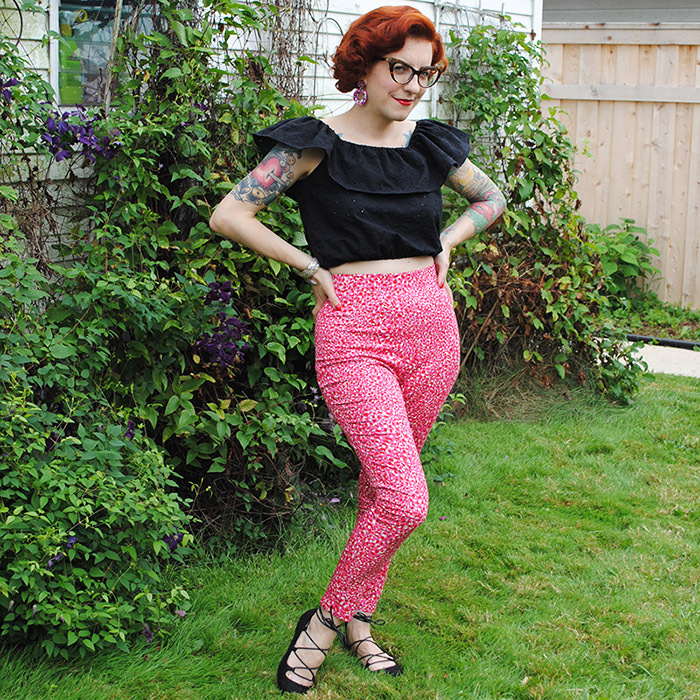 Today, she's sharing a very cute peasant blouse with us, but keep your eyes peeled for her own post soon, taking us through her pink leopard-print cigarette pants too! 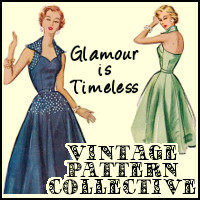 I am so happy to be participating in the Vintage Pledge July extravaganza! My pattern is from the era of my youth, and not an era whose fashion I typically go for...the 1980s! It all started because I had a style of top in my head for awhile that I wanted to sew, but I could never turn up a pattern to recreate it! 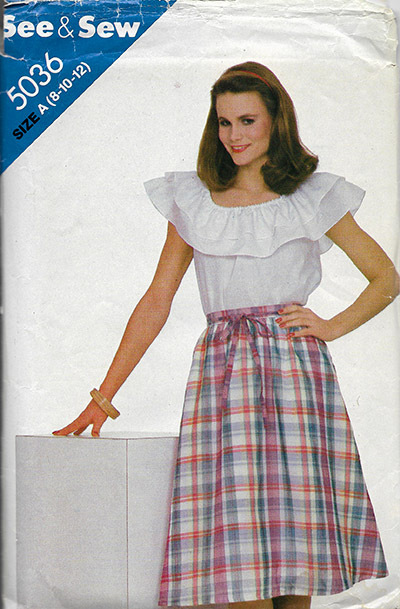 Until recently on a fortuitous Etsy hunt, I picked up this pattern from the 1980s, See & Sew by Butterick 5036. 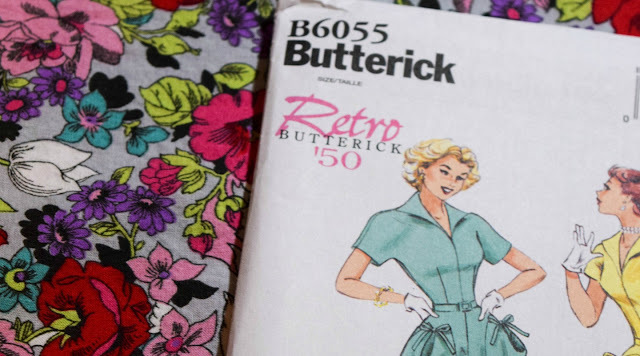 Until now, I’d never sewn a pattern from the 1980s! 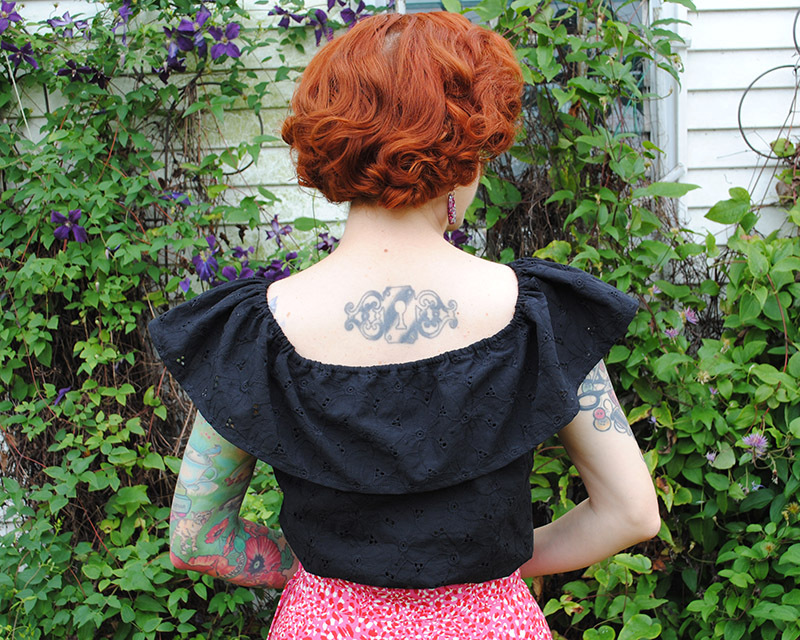 It fit the bill: peasant blouse style, with a ruffle at the neckline. Actually it had two ruffles which was one too many for my taste, but an easy thing to change! I used a black embroidered cotton eyelet fabric from Mood Fabrics , which is modest enough in the size of the eyelets that I didn’t feel the need to underline it (nor wear a matching bra, ha ha). But because of the eyelets, and the fact that I didn’t have black ¼” elastic to use in the neckline and waist, I actually used clear elastic. Which is more difficult to use in gathering evenly, I found, so it’s a bit more ruffley on the front than the back. I didn’t make very many changes to the pattern, but I’m really glad I carefully read the envelope to find out this pattern (in true 1980s style) had a LOT of built in ease - like 10”. Definitely a bit much for me. I didn’t want to change the shape of the armholes, so I simply took 2” each off the center of both the back and front pattern pieces to make it a bit more trim, but still roomy enough to pull over my head. This was an easy change since the neckline is gathered anyway. The only corresponding change I had to make was to cut the ruffle 4” shorter. You can see I made one stylistic change which I wish in hindsight I’d thought through a bit more. I wanted this version to be a cropped style for summer, gathered around the midriff. It didn’t occur to me until too late that since the front and back are the same size (no shaping), my bust pulls the front up more than the back, so the back sags down. I’m thinking a big chunk out of the piece like a swayback adjustment might be the ticket to fix that, if I try another cropped version in the future. Overall I’m very pleased with this fun little blouse! It was a fast and easy make. I could definitely see a few more in my closet for summer—some without my midriff moderation, maybe in other solid colors of eyelet or Swiss dot. It’s a winner of a pattern, for sure! And it goes to show that someone who typically wears styles inspired by an earlier era can borrow from a more recent decade to get the look they’re after! I'm a HUGE fan of Petit Main Sauvage's Lauriana, who is an incredibly accomplished stitcher and seems to literally rock every decade. So this heartfelt account about the challenges of sewing, and specifically the 'failure' of her #VPJuly project, really resonates with me. After all, we've all been there at one time or another, but I hardly think Lauriana can class anything as a failure given her gorgeous vintage makes from this year alone! If you have read my blog before, you may know that I’m not a beginner anymore. Not by a long shot. Although there are plenty of people who have many more years of sewing experience than I have, I think I sunk a lot of sewing time into the years I’ve have. That also involved learning to draft my own patterns, spending time helping a local designer and a lot of fabric shopping (with or without buying anything). I’m not writing all of this to brag, I’m writing it to give a bit of background. After all, failure is sometimes an unavoidable part of sewing. And I can tell from experience that the chance of absolute failure of a sewing project grows less as your skills and experience increase. A lot of early garments fail because we pick the wrong fabric for the project. Or a design, which looked great in the picture, but doesn’t actually suit us. Mistakes like that can be avoided with more knowledge and more experience. I don’t have many issues with failed sewing projects these days. There may be the occasional thing of which the making feels more like hard work than expected. Or something which looks good, but is not that comfortable. But real failure? That’s rare. It did, however, happen to the dress I wanted to sew for this post. 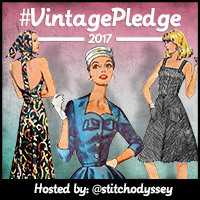 I have taken part in #VintagePledge since the start and every year, I have used it not just to motivate myself to sew from my vintage pattern stash, but also to get out of my comfort zone. Because of it, I have, on occasion, gone back to using patterns, tackled new pattern systems and new-to-me eras of fashion history. 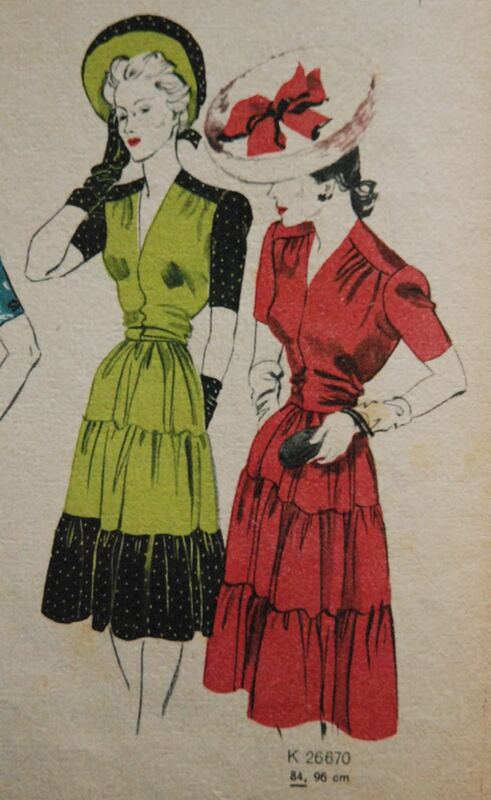 Of course, it would go wrong sometimes (I had some long struggles with 1930’s fashion in the past two years). This year, I had started well. After a bit of a struggle, I made a 1920s dress I’m really happy with. 1920s is so tricky. I’ve tried two dresses and both times ended up adjusting the patterns to make them a bit less sack-like. Which may completely ruin the period look. 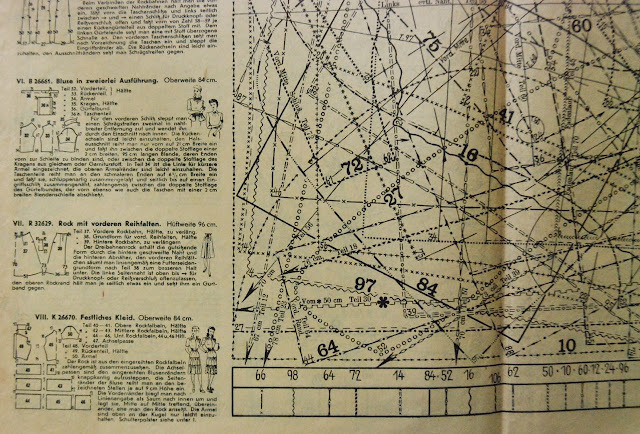 I found out that the 1950s patterns from Beyer’s Mode work for me without a lot of work. 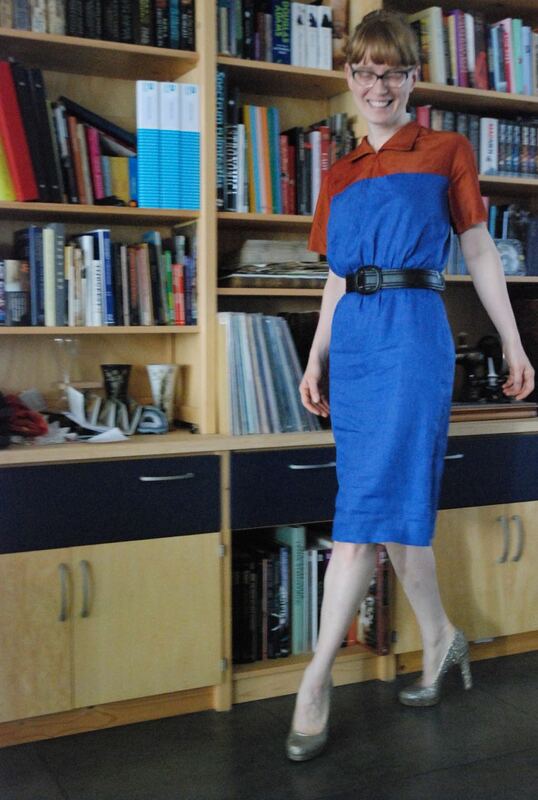 And I made my first (actual vintage, not re-print) early 1940s dress from a 1943 copy of the same magazine. And then came the moment I really had to decide what to write about for this post. My original plan was quite ambitious, but I won’t tire you with that (it had something to do with the sharing of old “draft to instructions” patterns which I am also doing on my blog this year). In the end I decided to make this dress, from the same magazine as that first successful 1940s dress. At first I wasn’t in love with the tiered skirt, but I had warmed to the look. The pattern was actually for one size smaller than mine, which gave me the opportunity to try something: Make it from jersey. 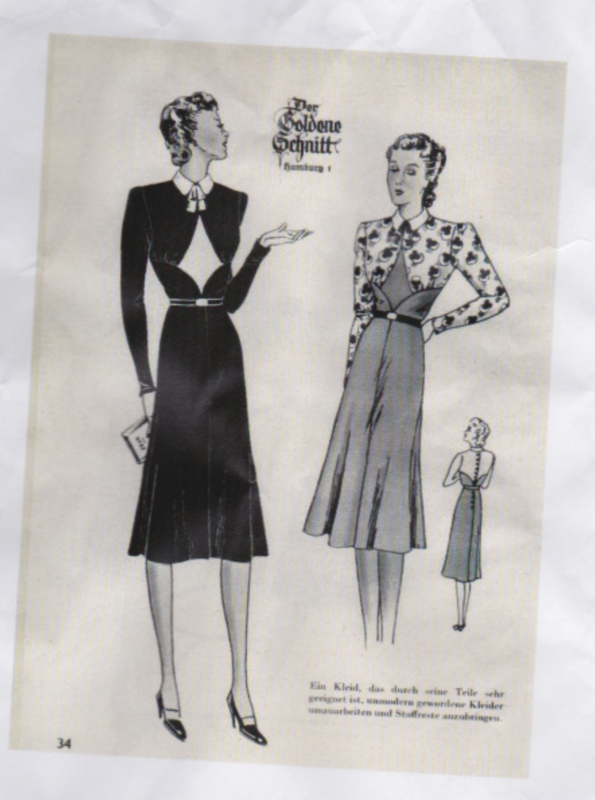 A lot of 1930s and 1940s dresses should have a sleek fit, which we could achieve most easily and comfortably by using jersey fabric. I’ve seen this done on other blogs, but I had never tried it myself. I thought it would make for a nice, comfortable dress and something interesting to write about. I happened to have some thin jersey in my stash with little to no lengthwise stretch. I thought it would work well for this dress. Maybe the colour was a bit boring but I actually have good precedents in my sewing career for making complicated dresses in grey. Tracing the pattern was not a problem. Yes, it can be daunting to do this for the first time, but I’m an old hand. I chose not to make a toile because I don’t think I have another fabric which behaves in the same way as this one. I did remember the one fitting issue with the first dress (not enough length in the front bodice) and and decided to cut more than double width seam allowances on the top and bottom of the front bodice piece. Then came the cutting. The subtle stripe, which I liked in this fabric, is actually on the wrong side. It is the most stretchy thread in the fabric. 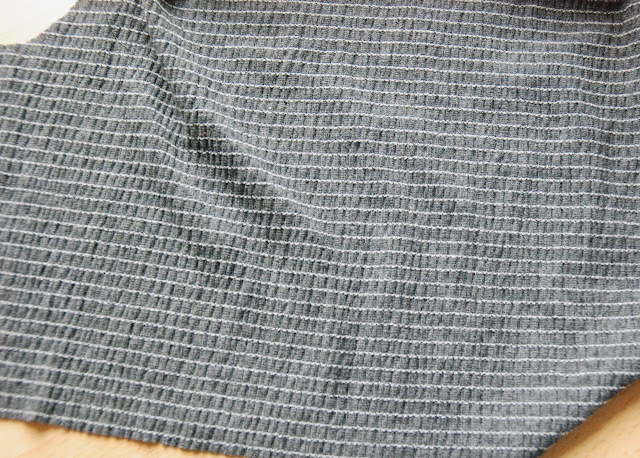 It actually gathers up the thin grey knit. And it forms ever-so-slightly wavy lines…I did a lot of adjusting with the cutting out of those skirt tiers. And that was after I had to consider whether or not to adjust for a fabric lay-out on 140cm instead of 90cm. The pattern doesn’t give any lay-out information, but the skirt tiers are pieced to fit on 90cm wide fabric. I cut everything apart from the bottom tier. By now, I was starting to regret going for this skirt. Sewing usually makes me feel better about a project. It didn’t this time. Gathering this material is SO annoying. It seems impossible to get the thread tension even and if you pull the threads later, they sometimes get snagged. There is nothing really wrong. Not yet. It may not be fun to sew this dress, but it is not impossible that I might still be able to turn it into a wearable garment. However, I lost faith in making this dress. 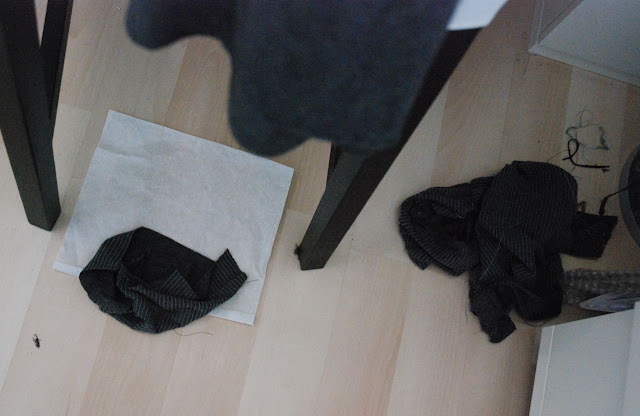 It is still in pieces on my sewing table and chair (and maybe some pieces fell to the floor). It put me off sewing for a week and when I returned, I felt I had to go and do something else. 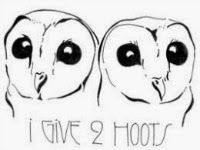 So here I am, as much as I love the #VintagePledge, it also presents me with the occasional failure, UFO and the frustration that comes with that. P.S. I’d like to take this opportunity to thank Marie and Kerry for their great work for the VSPP, which is made even more impressive by the fact they still keep up the good work over the years! Wow! 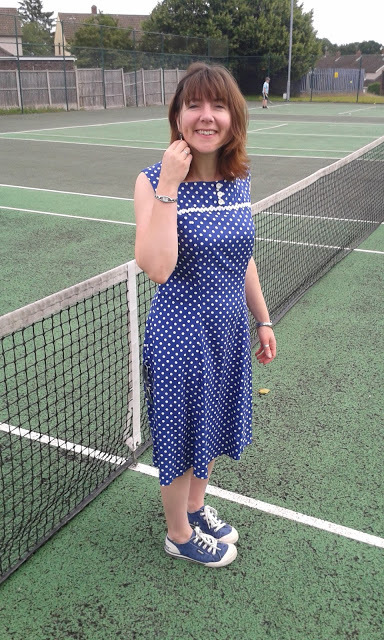 Jo's, of Three Stories High, foray into unprinted vintage patterns has resulted in a seriously adorable tennis dress, complete with polka dots and ric rac! What's not to love about this make?!? Best of all, she attributes her brave approach to taking part in #VintagePledge since 2014. 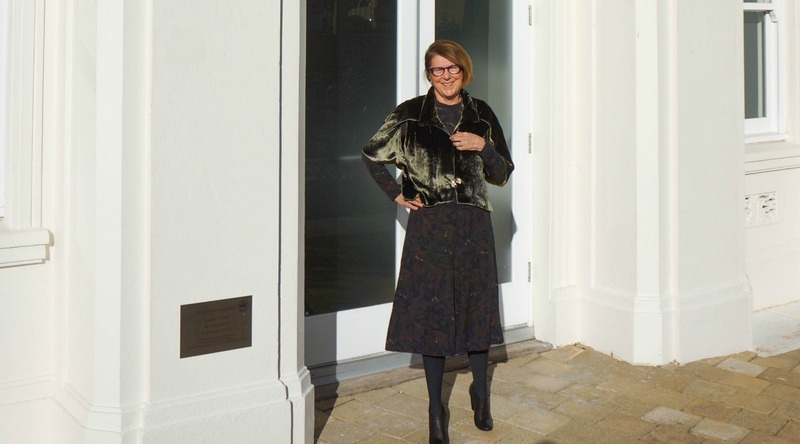 Well, Jo, it's been a pleasure following your vintage journey! 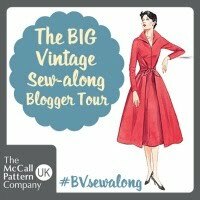 I am excited and honoured indeed to be joining an esteemed list of bloggers and makers joining in the July Vintage Pledge EXTRAVAGANZA. It means a lot to me because without joining the vintage pledge last year I don't think I would have improved so much as a dressmaker through the inspiration it gave me. 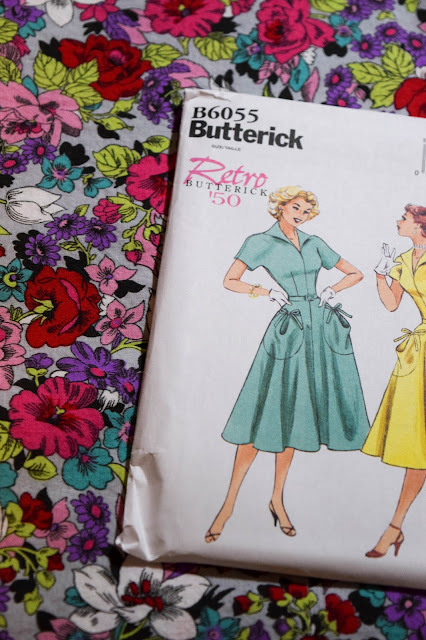 I had been an admirer of vintage patterns because I liked the artwork, but now I can truly say I am a maker of a wonderful wardrobe full of them thanks to the Vintage Pledge 2015 and 2016. For this guest post I wanted to try to use an unmarked vintage pattern. You know, a little challenge to myself, a little step up. I love this pattern and have avoided it for over two years now because it is 'pre pattern marking' and that is a bit scary. Now if I am going to be totally honest with you, my heart was with the shirt dress. I wanted to try the princess seams to give a shirt dress better shape for me, but in reality when I got the paper pieces out, I got a little bit frightened about putting on a collar and button band without any markings. I knew it would be possible, but I kind of chickened out. No matter, as the other tennis dress was really beautiful too. The square neckline attracted me because I didn't have anything like that in my wardrobe. So I cracked on cutting out and marking every tiny hole. I tacked the whole dress together. That is how I have been working recently. 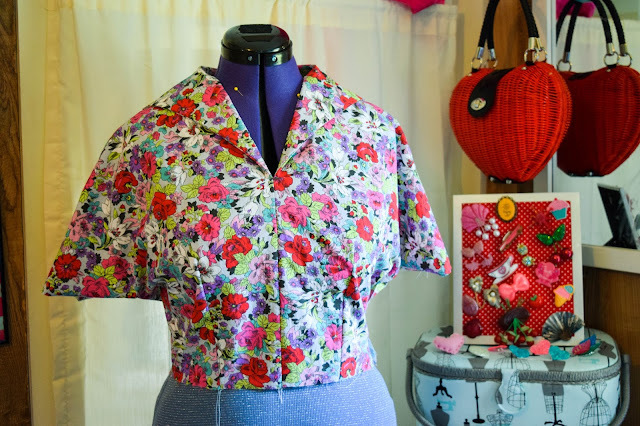 I have only ever made one toile in my life and that was a self-drafted pattern. Tacking a whole outfit works for me because I have made so much now that I have a good idea of what I need to alter when I cut right at the start. I made a few changes. If you are a long time reader of my blog you will not be surprised to know it was too long in the body. This is just what happens on me and why I make my own clothes. I also made it longer because I was not going to be playing tennis in it even with those big ball pockets stood on a tennis court! Lengthening was a strange phenomenon for me because I usually have to shorten things. The fabric is a thick viscose with a lovely drape purchased from the stitching show last year at the NEC in Birmingham, the grand purchase total being £12.00. At the end I added on the ric rac because I am a sucker for the stuff and the buttons are shown as on the pattern. I added three purely because there were three in the packet. Will I be tackling another unmarked pattern? I wouldn't specifically hunt one down, but if I really liked a pattern/design/image, it wouldn't stop me from having another go. 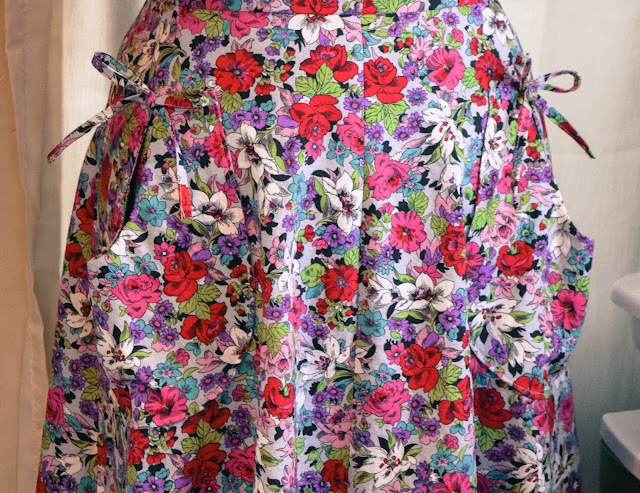 Do join in with the pledge if you haven't already - it could be something as simple as a skirt to get you going or you could end up like me and make nearly all of your clothes from vintage patterns by the end of the challenge. 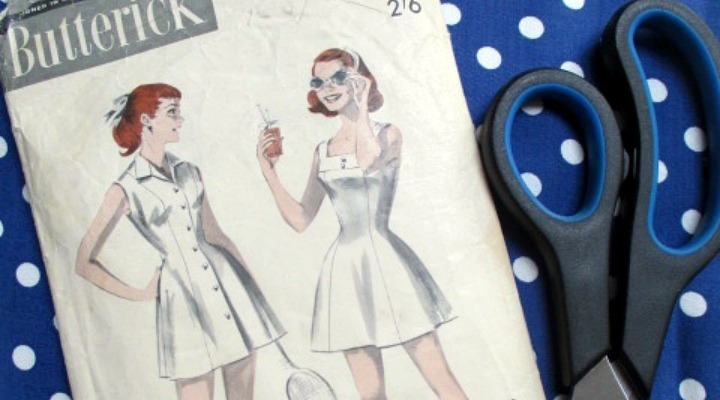 My motivation to sew more generally definitely started with the Vintage Pledge back in 2015. It really has been an inspiration. Happy sewing one and all. Thanks Marie, I feel totally honoured to share one of my vintage makes in your creative space. 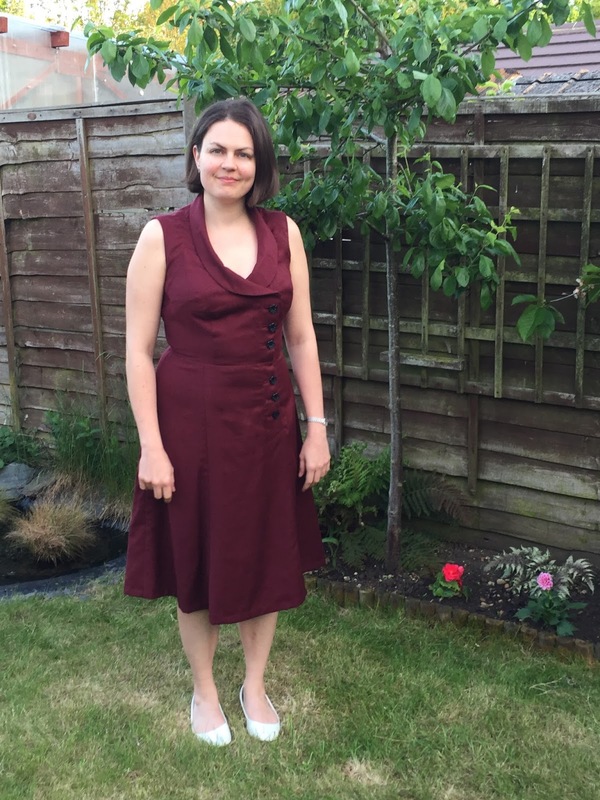 Despite her last-minute change of plans and reservations about her alternative pattern choice, Gabrielle of Up Sew Late has sewn a gorgeously practical dress for #VPJuly! In her floaty coral number, she's certainly channeling Diane von Furstenburg by the Castle. When you hear the name 'Diane von Furstenberg', wrap dresses are probably what spring to mind. They're the style she's most famous for of course, but she also designed loose fitting dresses like this one - and from the number of copies of this pattern I've seen for sale, I'm guessing it must have been a popular style. Loose-fitting, A-line, pullover, blouson dress, seven inches (18 cm) below mid-knee or ankle length, has scooped neckline, round collar, center front neckline slit with button and thread loop closing, elasticized waistline, pockets in side seams, narrow hem and top stitching and edgestitch trim. 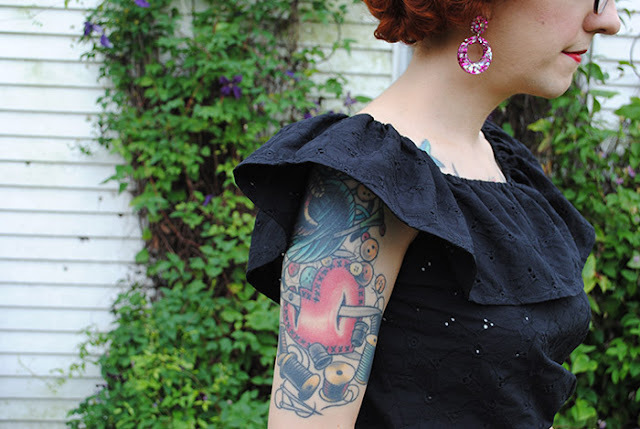 Above or below elbow or full-length sleeves are gathered into buttoned, shaped turn back cuffs. Purchased belt. And why did I choose to use this pattern? Well, to be honest, even though I'm very happy with the dress I've made, this pattern wasn't my first choice! 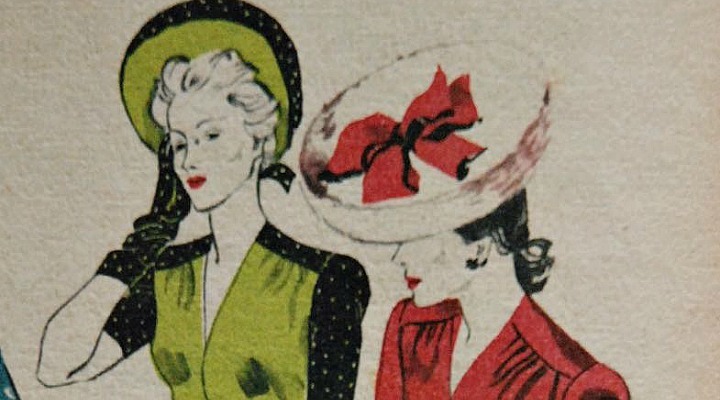 I had two first choices: a red and cream striped 1940s summer dress, and a cream wool and lace 1940s winter dress, both already well underway. I'm very sorry to say fitting issues with both dresses got the better of me when I tried to finish them up (for now - but I will conquer these dresses! ), so I had to step away from the 1940s and towards a more recent era. My next thought was to sew something fun and exaggerated from the 1980s. 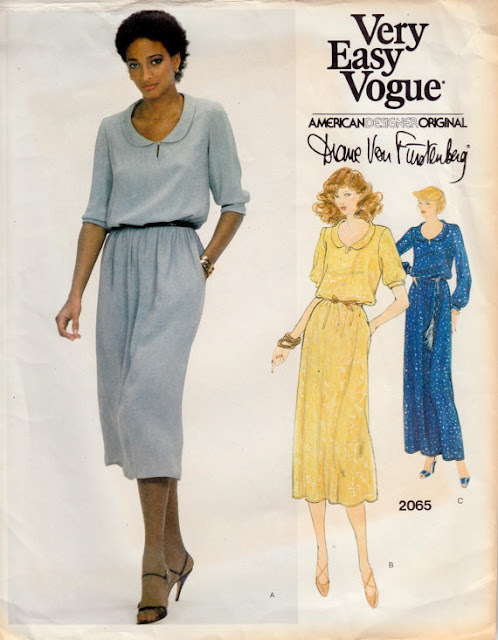 I got so far as to identify a couple of very cool and unusual Vogue Individualist patterns in my 1970s/1980s filing cabinet drawer, but then an annoyingly sensible voice piped up in my head and reminded me I already have a wardrobe full of fun clothes that get very little wear. So I made a second pass through the filing cabinet drawer, this time looking for 'wearable' and 'suitable for the office (or casual weekends)', and came up trumps - THIS DVF pattern; pretty, office-appropriate and very wearable, and even in my size. I really hope the very bright pink fabric stops it from being a boring choice! By the way, please excuse all the crumples in the photos - I did iron the dress properly, but I then drove into the city to take these photos wearing the dress, and apparently driving makes silk crepe de chine rumple and crease! I usually sew a size 12 in modern Vogue patterns for my upper half and a size 14 for my lower half, but I thought 1970s sizes might be a little smaller than modern sizes, so the straight size 14 in this pattern looked about right - and it was. The pattern was straightforward to sew, though the amount of hand stitching required took me by surprise and meant the dress took a lot longer to finish than I'd anticipated. My gorgeous, very drapey silk crepe de chine comes from last summer's sales at The Fabric Store here in Sydney, and it proved to be the perfect choice of fabric for this dress, even if I didn't have quite enough of it (my neckline and cuff facings are cut from a different fabric). 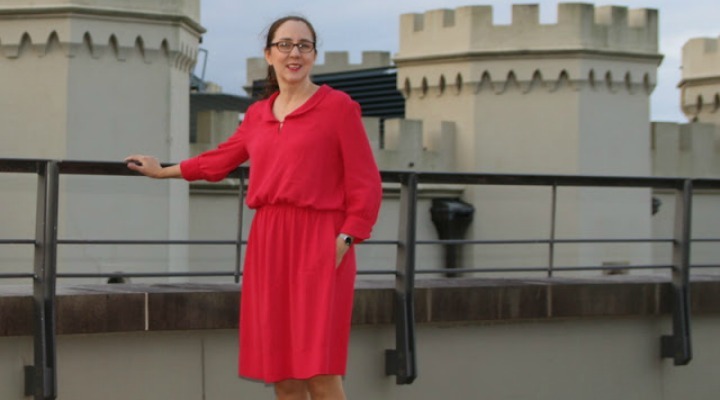 You don't normally see castles in Sydney, but yes, the building behind me in a couple of these photos is very castle-like. The building was apparently based on Inveraray Castle, and was originally built as a 'palace for horses' (ie stables!) 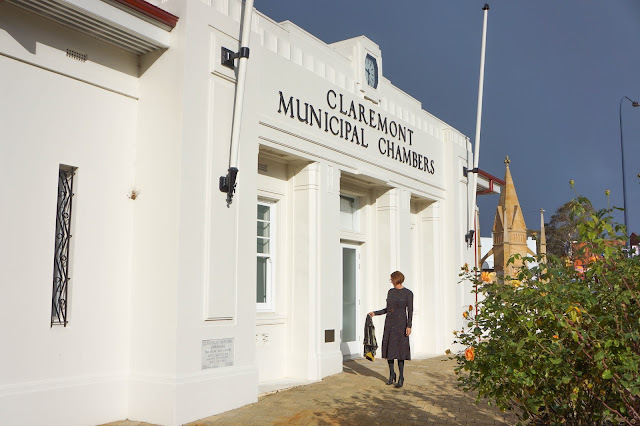 for the 5th Governor of New South Wales. And it's now the Sydney Conservatorium of Music, which I think is a much more suitable use of a small castle! If you compare my dress to the detailed description above you might notice a couple of differences... firstly, my dress is knee-length, not 18cm below mid-knee, and secondly, where's that top stitching? I did have to make another surprise adjustment as I was sewing the dress - but it's one that's not as noticeable. 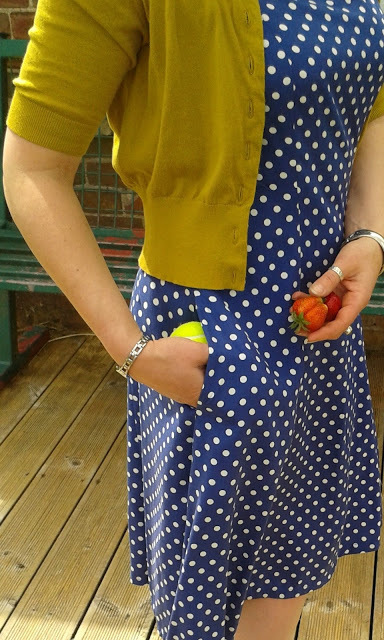 When I tried the dress on with the cuffs pinned in place before sewing buttonholes, I noticed that the cuffs were very tight on my arms, so to gain a few millimetres of width I've sewed press studs with buttons on the outside instead of buttonholes. There was actually supposed to be a second button on those cuffs, just in case the cuffs were too loose, but I didn't see any point adding buttons that I will never be able to use so I left them off. Obviously too I have yet to get a purchased belt, and my hemline really needs one. I did a lot of measuring and marking and trying on to make sure that hemline was horizontal, but you wouldn't know it because the elastic at the waist tends to move up at my hips when I walk around, and that makes the hem rise at the sides! I wish I'd noticed before we took photos... but I know it'll be fine when I add a belt. So, what's the overall verdict? Well, pleasantly surprised! 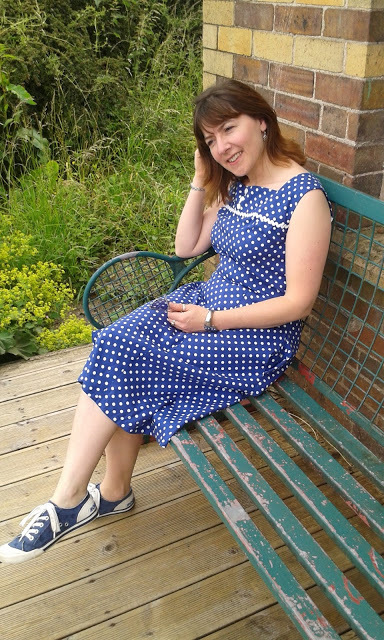 Mid-way through making this dress I was really worried about my pattern choice; it was looking so much like a nightgown that I thought it was going to be a wadder - and what a waste of hours of handstitching that would have been! Thankfully the elasticized waist pulls it back into "dress" territory, as does the shorter hemline - phew! - and I know this dress is going to get a lot of wear. Thank you so much for having me, Marie! Burgundy Belle. That's what Claire of I Want To Be A Turtle has called her #VPJuly contribution, but I totally think it applies to her good self as well. She looks incredible in this early 1950s number and choosing a block colour has made the interesting details really pop! Have you ever made a pattern just for the lines of the item? This is what happened here - it is an indulgent rather than a necessary make. 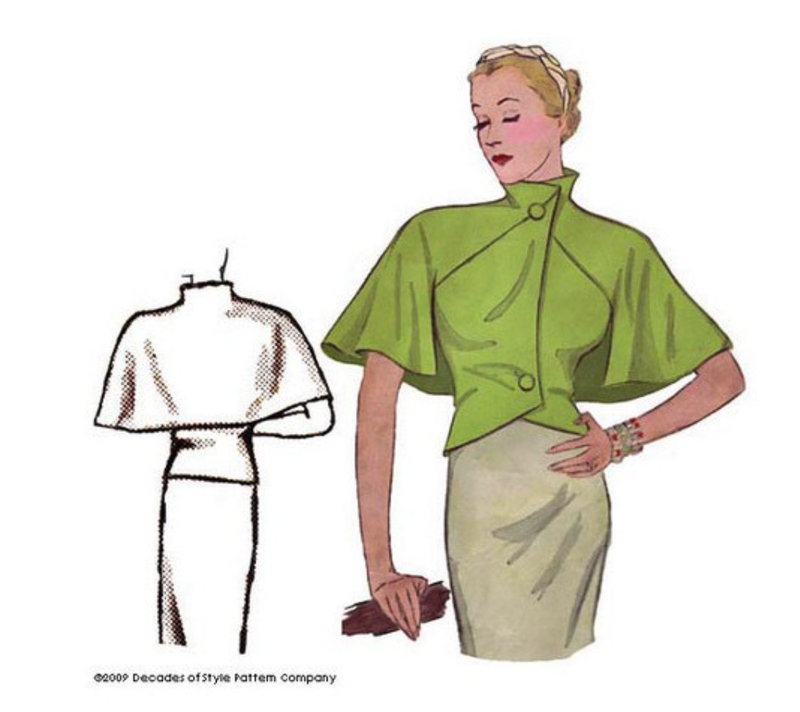 I fell completely in love with McCall's 9009 from 1952 when I was browsing Etsy. It offers three options: a sleeveless dress, a jumper and a blouse. I couldn't get past the red dress in the illustrations - that collar and off centre buttons! I had to own this pattern, even if the envelope was falling apart. The suggested fabrics are pique, denim, gabardine, rayon suiting, lightweight wool, linen, corduroy and velveteen. Plenty of options to get your imagination running! I wanted a plain fabric so the lines of the pattern would shine and dug out this redcurrant wool from my stash. The fact that it is the same colour as the pattern illustration is a pure coincidence. The wool is medium weight and comes from a delightful little fabric store in Zadar, Croatia. The dress is underlined with a white cupro bemberg which takes the insides up a level, but also keeps the wool's itch factor under control. Black flower shaped buttons finish the outfit to add a little more interest. 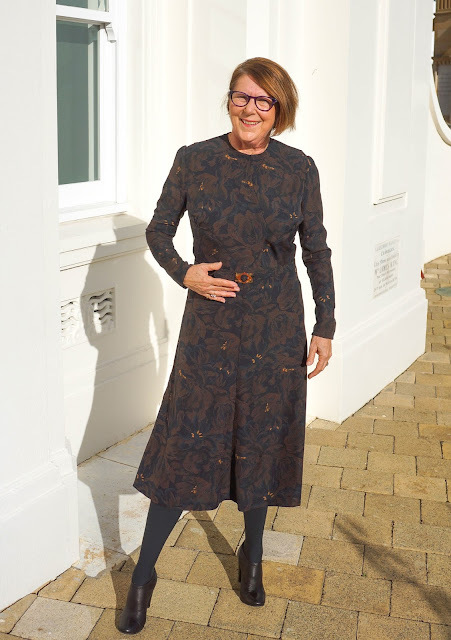 The dress works perfectly in this wool although I wouldn't use anything heavier due to the bulk it would create, especially in the skirt which is made from six pieces and includes button plackets. Getting the fit right was tough - three toiles of the bodice were needed. I knew a number of changes would be needed as the pattern is size 12 and I'm bigger across the board. Alterations included: 2" FBA, bringing the side seams forward, adding a small amount to the back bodice and quite a lot more to the front bodice. 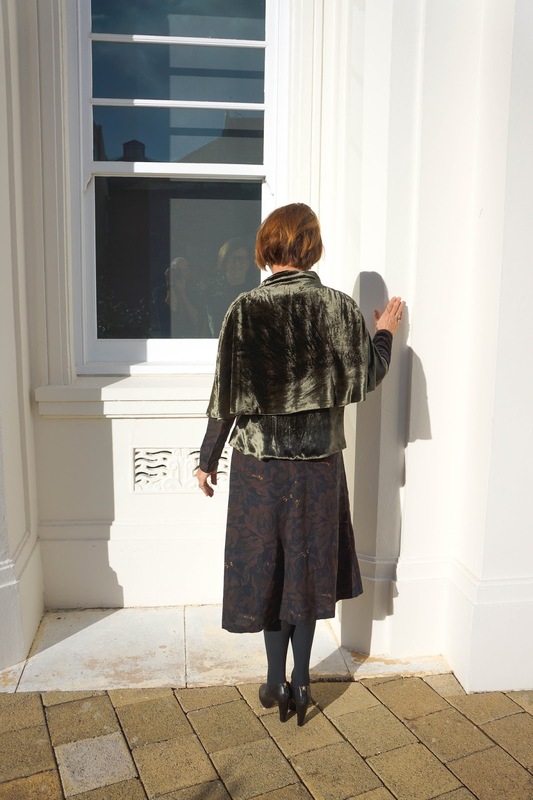 I chopped off about 15cm from the skirt length so the hem finishes at mid calf as designed. Removing this additional length meant I could squeeze out the pattern from two meters. Sewing up the dress was straightforward but it isn't a quick make. 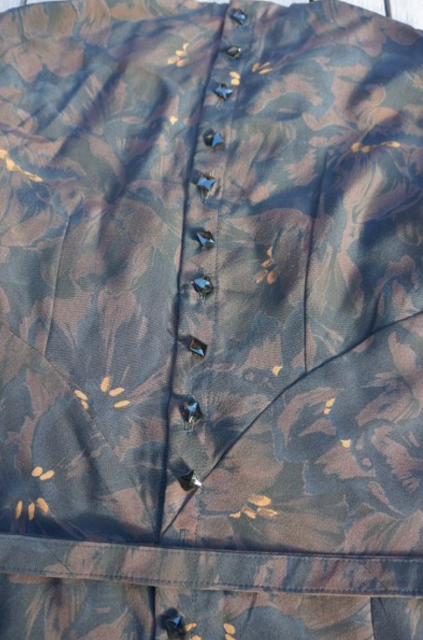 It demands six bound buttonholes almost immediately and a lot of hand stitching. The collar and sleeves are finished with facings and these are fully anchored into place with slip stitching. I tried to avoid this and just tacked the facings in places but the finish was comprised. The hem of the skirt is also hand stitched. 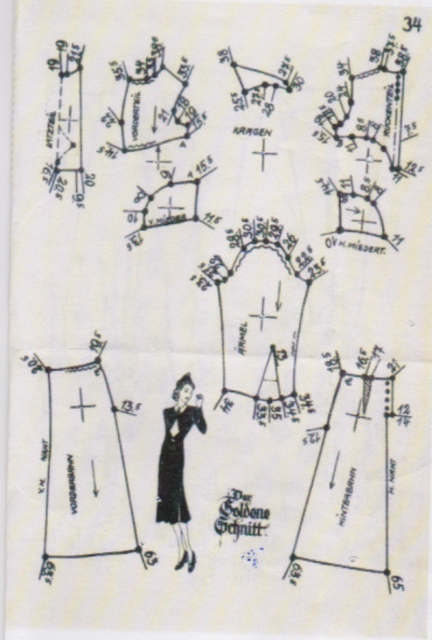 Adding the button plackets to the skirt was the most confusing part as the diagram and instructions weren't too clear but once you work it out, it's relatively simple. The instructions are succinct but enough to get you through if you have some experience. I was impressed with how they explained bound buttonholes effectively in only a few steps! While I loved almost every moment of making this dress, I had this nagging fear that it would end up hanging in my wardrobe with very little wear. The style feels rather different to what I normally wear and I wasn't sure I would be comfortable in something that is so clearly a vintage style. 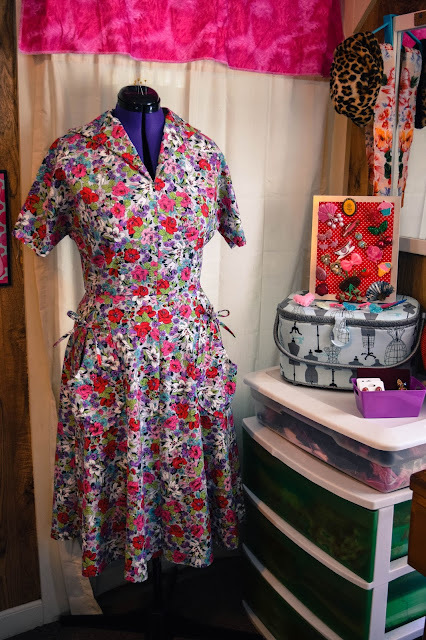 I finished the dress mid-March to give me time to wear it before the spring weather came and the dress got a surprising amount of wear - I'm now disappointed that I have to wait until the Autumn to bring it out again. It turns out that this dress is a confidence booster and one that I'm not scared to wear in the office. I would wholeheartedly recommend this pattern if you're looking for something a little different. I'm convinced I will get more out of it - I'd love to make the jumper in addition to a summer version of the dress.